Clermont-Ferrand, 28 September 2018 – (FR0004177046 METEX), METabolic EXplorer (METEX), an industrial biochemical company specialising in the development and industrial application of green and sustainable fermentation processes, publishes its first-half financial results on 30 June 2018 and reviews its activities in the first half of 2018. During its meeting on 26 September 2018, the Board of Directors approved the financial statements for the period ended 30 June 2018.
revenues received under agreements signed with the Finnish group UPM for development of MPG and for its postponement. Operating expenses increase slightly owing to commercial expenses for the project to construct a production unit at the Carling Saint-Avold site (studies and legal expenses) as well as marketing expenses for new products. 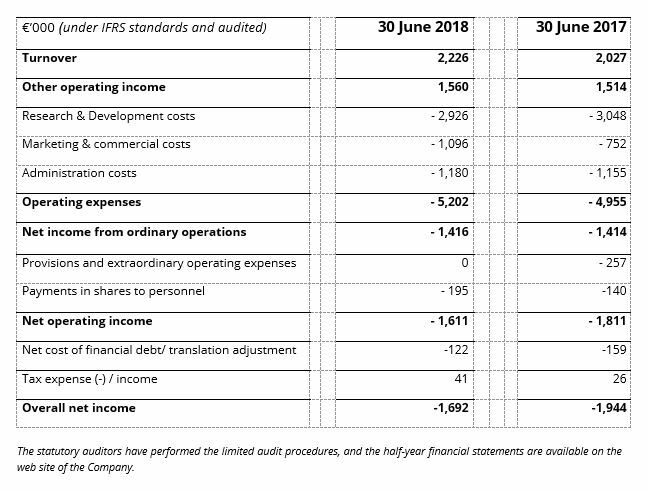 Ultimately, net income from ordinary operations remained stable at -€1.4 million. As of 30 June 2018, the company’s gross cash position stood at €32.5 million (compared with €31.3 million at 31 December 2017). With a debt of € 5.9 million for shareholders’ equity of € 44 million, the net cash position is €26.6 million (compared with €25.2 million at 31 December 2017). The cash position as of June 30, 2018 includes an amount of €2.4 million following a release obtained on a precautionary seizure and also includes a cash receipt of €1.8 million for tax credits, including €1.7 million of Research Tax Credit. Today the Group is focusing on its project to construct a production unit at the Carling Saint-Avold site with the creation of a joint venture, METEX NØØVISTA, and on the addition of new products to its portfolio with the development of new processes for producing additives for animal health and nutrition and ingredients for personal care products.